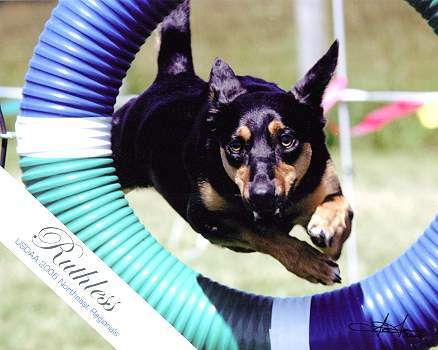 Ruth went to Kristen in Virginia, U.S.A. to work in Agility Trials over there. 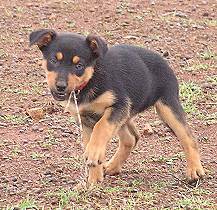 Megan the dam is one of the most athletic Kelpies we have ever known so it is not surprising that her pups are very fast and agile. This pup was especially chosen for Kristin to be relatively calm at home but able to show real drive and determination when competing. She was a nice balance of both parents. Well they are off to a good start with her. We have had a few phone calls and emails about Noonbarra Ruth and Kristin is delighted with her. Her family wrote to us as soon as she arrived: "Just wanted to let you know that Ruthless (Ruth) arrived safe and sound. Qantas did a great job. "She is delightful. 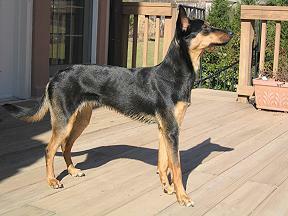 Rambunctious, energetic, affectionate, loving and seems very smart. Eating and drinking well. Stools are fine and no sickness or anything. Already learning some of the rules of the household and how dogs are to behave with us. She has captured our hearts already. Kristen has not seen her yet as she is in a major agility competition this weekend. But she knows that everything is OK and will be with her Monday. Although I (Peter) am not sure I will let her have the puppy! Take care. You guys did a great job!" 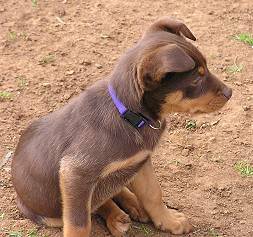 Kristin arrived home and wrote: "Hello Mary and Stephen, I wanted to e-mail you to let you know that I love my puppy. She is a lot of fun and she has a great personality. I think she is going to be exactly what I was looking for." Hi Mary, Stephen, I just wanted to e-mail you to let you know that Ruth is doing great. I took her to her first dog show and she had a great time meeting other dogs and people. She did not have any fear at all. "Everything is going great. She has become a wonderful part of the family. I have started our beginner agility lessons and she is having an awesome time. My instructor is very impressed with her. She finds Ruth very intelligent and thinks she has a great personality." I just wanted to let you know how Ruth is doing. She has really grown up lately and she is a wonderful dog. I cannot begin to tell you how happy I am with her. You guys did a great job of picking the perfect dog for me. 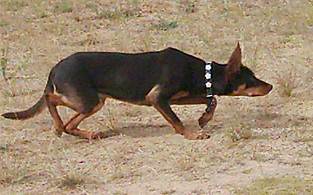 She has great working drive and she is the most athletic and agile dog I have ever seen. She is such a beautiful mover and she is really enjoying our agility lessons. She sounds a lot like her mother in the sense that she is very happy all of the time. She loves all people and all dogs. 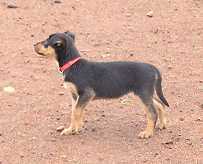 Ruth is extremely intelligent and very obedient, and she is only 6 months old. I guess you could call her an all around great dog. She comes to all my agility shows with me and everyone just falls in love with her because of her sweet personality and they also think she is quite pretty. She still needs to fill out a bit but she is really starting to look mature. "I have nothing but absolutely wonderful things to say about this dog! She has really done a lot of maturing in these past months. I can not even begin to tell you how wonderful she is and how much I love her. ..
"She and I have just become the best of friends. She sleeps against my side every night and follows me everywhere I go. She is just the happiest and sweetest dog I have ever known. I don't think there is a bad bone in her body. She always does as told and she always seems to have a big smile on her face while doing it. She has really grown into an amazing companion. She is so unbelievably intelligent as well. It's just like you said, she seems to know what I'm thinking before I think it. " 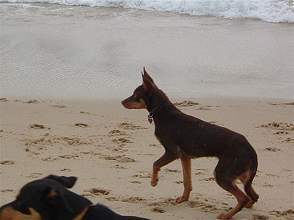 "She and I have really started to do a lot more agility work now that she is almost 18 months. I got her x-rayed and her growth plates were closed so it is safe to do a bit harder of work now. I have mostly been working her contacts and she is just now learning how to weave. We do some sequences as well. Those are a bit harder for her though. She has a lot of drive and a huge stride and she is not quite sure what to do with it all yet. We are working on that though. 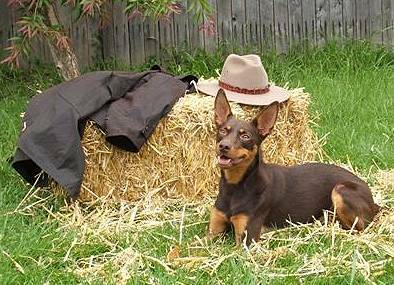 I have had a lot of kelpie people tell me that they are a very difficult dog to train in that they can be stubborn but I have not seen any of this in Ruth. She is so eager to please me and she tries so hard for me. She wants nothing more than to do the right thing which makes her an absolute joy to work with." "She also gets complements left and right about how pretty she is. I will get an updated photo for you as she has filled out a lot since the last ones. My instructor has fallen in love with her as well. 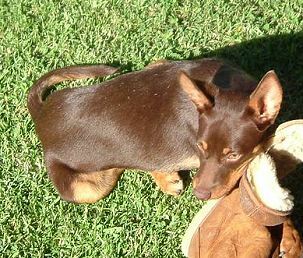 She has always been strictly a border collie person but she told me the other day that Ruth is the kind of kelpie that makes you want to get one. I get a lot of questions about where she came from and I tell everyone what a great job you guys did for me in picking my perfect dog. " "I really don't know how to thank you both for such a wonderful dog. She is more than I could have hoped for. 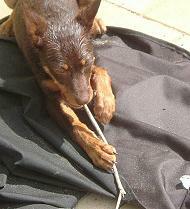 After having Ruth, I'm not sure if I can have anything but a Kelpie from now on!! I have exciting news! Ruth just had her very first agility show this past weekend. I wanted to let you know how wonderful she was. Most dogs, when they have their first trial, get so excited they almost seem to forget all of their training but Ruth was wonderful. She went out there and acted like a professional from her very first run on. She knew that she had a job to do and she did it beautifully. Of course she was a LOT more excited than when we practice but this makes it all that much more amazing. She was so excited but held her brain together and remembered all of her training. She qualified in her jumpers run. She is an absolute joy to work with and I got a ton of compliments on her. I wish the photographer had gotten some good pictures of her so I could send them to you. Next time I guess. 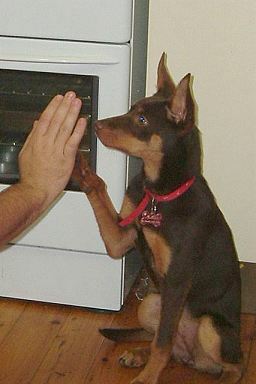 Every time that I e-mail you or talk to you, I am going to thank you for such a wonderful dog. 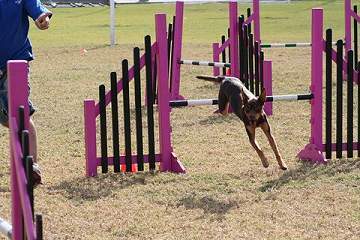 She just loves her agility so much and I love to work with her. She is so much fun and so willing to learn and also just so smart! She has really turned out to be an amazing dog in every way. We are now competing in the masters level and she just keeps getting better. Her athleticism is very impressive. She is truly lovely and she just means the world to me. Owned by Lauri and Adam Fettell of Woolongong NSW. 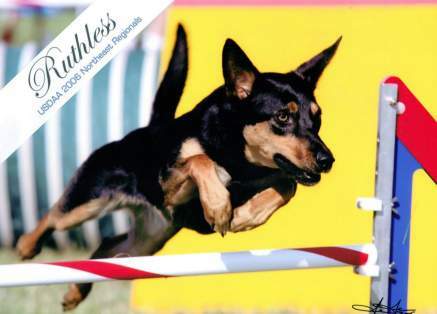 Noonbarra Matilda was sold for the sport of Flyball. 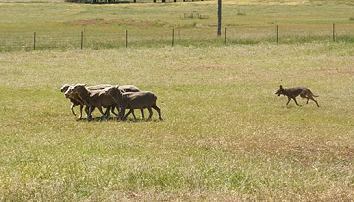 She had a nice combination of calmness and drive and was also working sheep before she was even 8 weeks of age. She has a lovely personality and is very friendly and easy to handle. 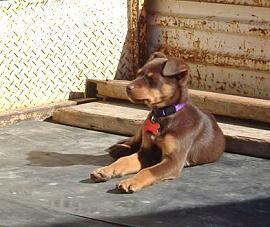 "This is Matilda making herself comfortable on the back of Adz ute... She went to her first fly ball demo and she met her family members Noonbarra Matilda 2 and Noonbarra Bindi. They were lovely dogs." Noonbarra Matilda III and Pjay on owners bed! 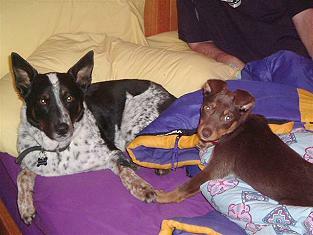 "Pjay and Matilda on our bed, they like to play together now..."
Noonbarra Matilda III and PJ are great friends! 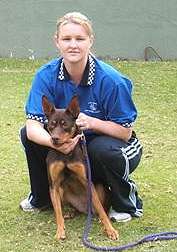 Adam and I went to a Flyball comp, held at Erskine park just out of Penrith. We came first, undefeated. I had your hat on all day and A lady came up to me and asked if I actually had a Noonbarra Kelpie and could she see it, so I showed her Matilda 3. She is going up there in the next few weekends she said and after seeing Matilda she made a joke that she will be taking her Cheque book. So hopefully the hat you gave us will give you guys some advertising we have now had a few comments at the last two Flyball comps. Noonbarra Matilda III and her great kennel. 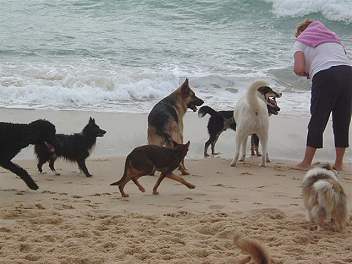 "Here is Matilda on Coniston Beach with some of her friends from south coast dog training club, on there Breakfast on the Beach which they hold every couple of months over summer..."
"This is Matilda doing one of her tricks she is giving high 5 she now gives 10"
We got a nice email in September 2005 and heard that Noonbarra Matilda III met up with Noonbarra Cobber and Noonbarra Kobe II at a Flyball Competition. 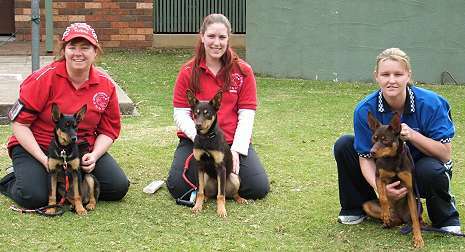 "Just got back from our kiola comp, here is a photo of Matilda 3 and Cobber and Matilda's full sister (roy and sarah as parents born 17 weeks ago) can't remember the girls name sorry, but this is after a full day of flyball racing with these guys watching waiting for there turn. Matilda is now doing four jumps and the box we now just have to put it all together"
"Here is Matilda in her first Agility Comp, she went really well for her first one. She is great and very well behaved now after a few obedience lessons. She will compete next month and hopefully will get better." "I am thrilled with Delboy. I think he looks great and I can imagine what he will look like when he is fully grown. More importantly I love his attitude and the way he moves. I feel privileged to own such a dog." This was a very handsome looking male sold to Nick Milsum in New Zealand for the sport of Agility. 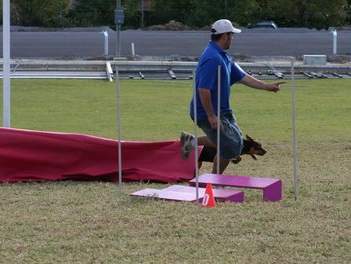 Mr. Milsum is an Agility judge. Delboy was also sold to be a close companion. Nick was very particular about what he wanted in terms of behaviour and temperament. We are pleased to report that Delboy passed with flying colours.
" Dear Mary and Stephen. This is the message I have been looking forward to sending for a long time. Delboy arrived yesterday. When I looked into his cage he looked subdued but as soon as I got him out he gave me a great welcome. 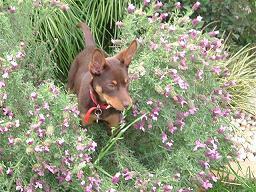 I took him to a grassy area and he went to toilet right away (by the way have you a command for toilet). During the trip back to Rotorua he slept on my lap while my friend drove. 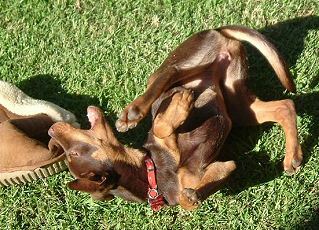 This morning he has been a play in the park with my younger dog and he has another play coming up soon." "I am thrilled with Delboy. I think he looks great and I can imagine what he will look like when he is fully grown. More importantly I love his attitude and the way he moves. I feel privileged to own such a dog"
I would like to thank you for helping me choose such a dog. Also for the socialisation work that has gone into making him what he is today. 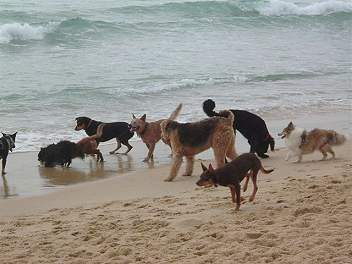 You must be very proud if all the owners are as happy as me. - Regards Nick. "Hi Mary and Stephen, I received papers today and book. Very professional and interesting. I am looking forward to a good read tonight. Delboy had a smashing weekend. Everyone admired him. I was busy but I was able to proudly watch him as different "volunteers" walked him around." "I can't get over how he has bonded to me. I have had some good dogs but he follows me everywhere and even in a busy agility grounds he was able to pick me out and drag himself to me. I have definitely got the "loyalty" quality I wanted. Well after a long wait I am enjoying every minute with Delboy." "Everything going well and I am very pleased with Delboy. Two days ago I had a visit by an old friend. In the l950s he was a Police dog handler in England. He was brought out to N.Z. 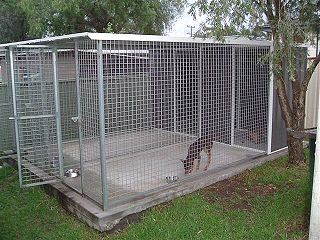 and helped establish the new Police dog section. A lot of his early work went into assessing breeding stock. He also continued to work Police dogs for another 20 years. I consider him to be an upmost authority on dogs and most people think he has a tail. He is blunt and speaks his mind which makes him unpopular with some people. 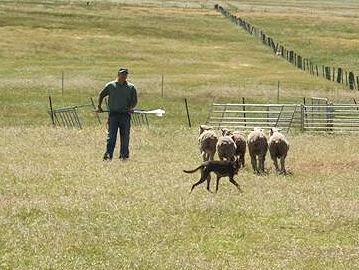 He started the recreation of tracking in N.Z. 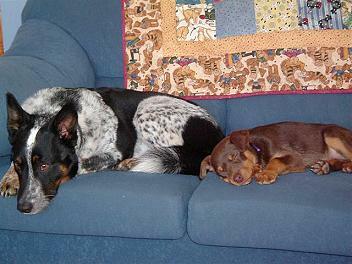 He has viewed all my dogs when pups and has assessed them. Sometimes he has not been very complimentary. He saw Delboy and rushed out to his car to get his camera. His wife then told me that he thought a lot of Delboy. He gave him a number of tests and Del passed them all. He said if he was a German Shepherd he would grab him for Police work. That is as high as him credits go. WITH NICK'S TWO NZ BORDER COLLIES. Hi Mary and Stephen, Everything going well and I am very pleased with Delboy. Unfortunately Nick couldn't keep Delboy and he went to Brenda for Agility Competition work. "Del has now turned a year old and is a great mate to have. 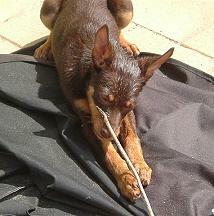 His Agility training is going well He is a very independent dog that has a great work ethic. He has all the confidence in the world to work well away from the handler and doesn't need to come back to hand for reassurance as a lot of young dogs do...Del will be old enough to compete in Agility in July and will be well ready to go by then (actually he is ready now) .... Del is very easy to train and a pleasure to have around. He also fits in with the other dogs well. - Brenda Jackson New Zealand.